Yesterday, Goldman Sachs named Michael Carr and Dusty Philip its new co-heads of M&A in the Americas. The two Goldman partners replaced Tim Ingrassia, who will become a co-head of global M&A at the firm. Mike previously held the same (co-head of Americas M&A) position back in the late 1990s, after he joined Goldman from Smith Barney. He later headed up Goldman's investment banking operations in Asia. Throughout his career, he's focused on deals in the natural resources and industrials sector; one of his largest deals was the 2010 merger of United Airlines and Continental Airlines. Dusty, meanwhile, landed at Goldman in 1991 and became a partner in 2000. Like Mike, Dusty has also focused on industrial deals. For the past two years, he's worked on Burlington Northern Sante Fe's $44 billion sale to Warren Buffett's Berkshire Hathaway, a deal that was finalized last month. 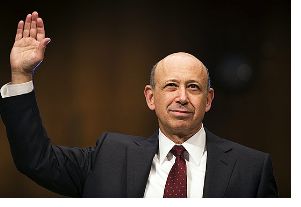 In other Goldman news, despite his ubiquitousness in the financial press, Lloyd Blankfein apparently is largely unknown to most people in New York State -- that is, at least to those in the jury pool in the insider trading case against Galleon Founder Raj Rajaratnam. Yesterday, when the judge in the case read off the names of potential witnesses, asking if anyone in the jury pool had heard of any of them, Lloyd Blanfein's name returned a room full of nays: not a single juror had heard of the Goldman CEO. In Lloyd's defense, this might have been due to the fact that the judge failed to mention that Lloyd is the banker who routinely performs work for the big guy upstairs (a.k.a. God), or the fact that the judge mispronounced the second syllable of "Blankfein," pronouncing it "fean" as opposed to "fine."